Oh yes I agree and the painting is most wonderful! It seems in this lovely picture that there is no protection to fall apparently several stories once you step outside.Please explain. I think Nancy Mitford and Franz-Ludwig Catel are correct! 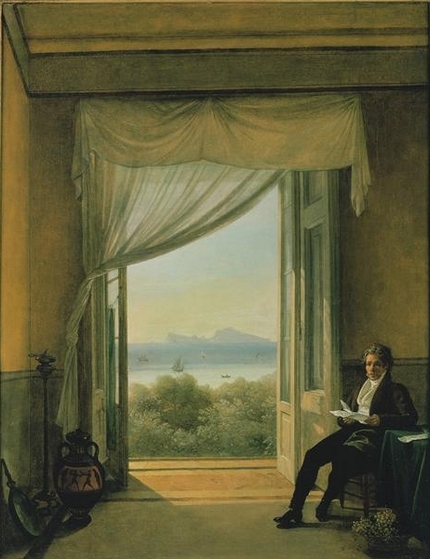 Catel's painting of Schinkel looked very familiar so I went back to the 2011 catalogue of the Rooms With a View exhibition, put on by the Metropolitan Museum of Art, NY. Thank you ... it still looks terrific. of the term French WINDOWS instead of French DOORS. Dear Gabor, According to several sources, the painting depicts Schinkel in a room he occupied for a month, in 1824, at Villa Reale in Naples; in the distance is the isle of Capri. I have checked period paintings of Villa Reale and determined that Schinkel's room was on the second floor. Period images show that the second floor of Villa Reale had metal railing; I do not know why Catel removed it for this particular scene. I couldn't agree more dahhling.. beautiful image. Always a treat to read your posts and the comments. Hi there! Loved this post! My opinion is that he left it out because it obscured the view he was showing! It was there so children, cats and dogs wouldn't go flying out to their deaths; however; this is a PAINTING! He was the artist...he got to pick! the painting is most wonderful!